The Alnoba Art Park Opens May 1st. 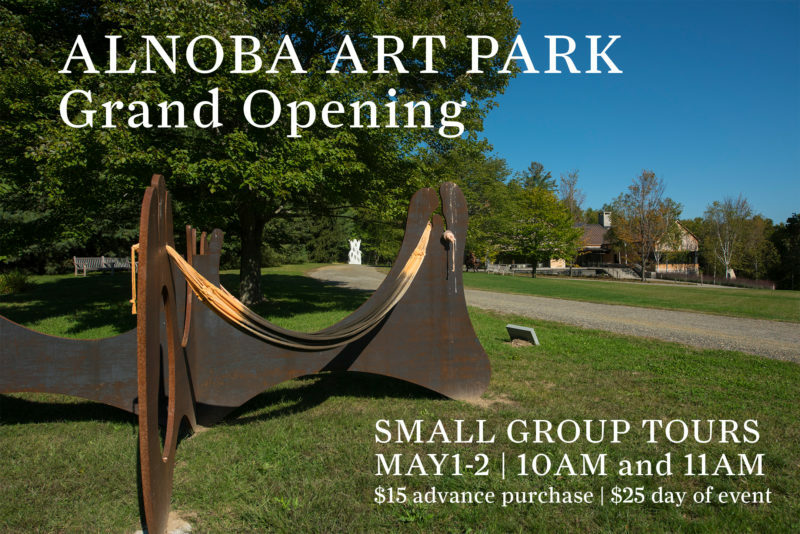 On May 1st and 2nd we will host private guided art walks throughout the Park for friends of Alnoba. We are so delighted to share this collection with our friends and neighbors. During your tour you will get to experience the art up close and hear stories behind the artists and works. Touch it, climb on it, lean on it. We want Alnoba’s Art Park to be a place for everyone to approach art, be outdoors and enjoy mother nature’s beauty and majesty. Our collection is international and eclectic. It includes masterworks by Andy Goldsworthy, Orly Ganger, Jaume Plensa, John Lopez, Allan Houser and Ursula von Rydingsvard. Some pieces come from our travels, others from chance encounters with the artist and some we sought out after reading their story. We believe that everyone experiences art in our own way and hope that the Art Park opens art up to more people of all ages to feel it for themselves! Tour length: Please allow 1.5 hours for each tour. Due to its location, the guided tour will not include Andy Goldsworthy, “Boulder House”. Guest are welcome to view Boulder House on their own after their tour concludes or stay and walk the trails or spend more time with the art. The tour includes outdoor portion on uneven terrain and ¼ mile walk. Hiking shoes and casual attire recommended.